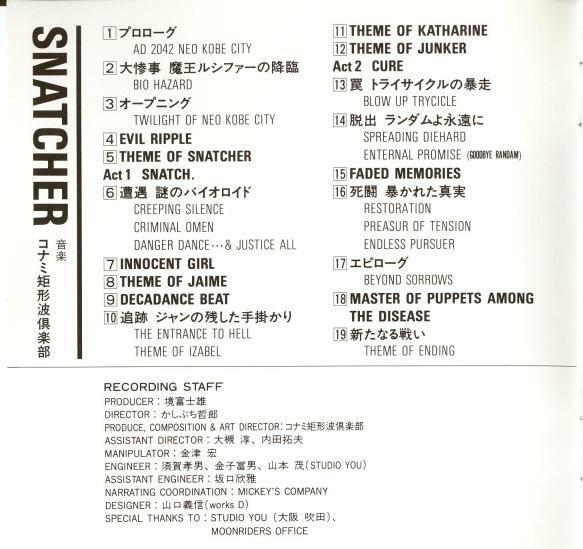 This is the translation page for the Snatcher "Radio Play" liner notes, which was done via an OCR and the kind help of Takamichi Suzukawa for translating them. The SJS files are available here for the curious. IKA: (1) Hello, everyone, thank you for coming spending your precious time today. This occasion (2), we have a special favor, we decided to gather the people other than the music developer, and hear from them the stories related to the development. Metal Slave Matsui: (Hereafter called Metal) I was doing the job that is named the supervisor. Black Ohta: I was in charge of, what? I don't know sure (...looking nervously) Aah, the mechanic design. Yes, that was my job. I'm Black Ohta. IKA: There are actually many other people, but today, we gathered these people as the representatives of their division. (Everyone is too busy with eating the potato jelly and no one is listening at all). Black: Well. I had a sort of pride as the Snatcher team. Not so much as the duty to make something good, but I was mentally pressured in that way, didn't you all feel like that? IKA: In that sense, this development was the one with big gut. Snake: Gut? I dragged my gut all the way into my dream. Black: Snatcher appeared in my dream too. Ultraman: In my case, the half of the things was the fight with capacity. I think the others people had considered the capacity issue as well. 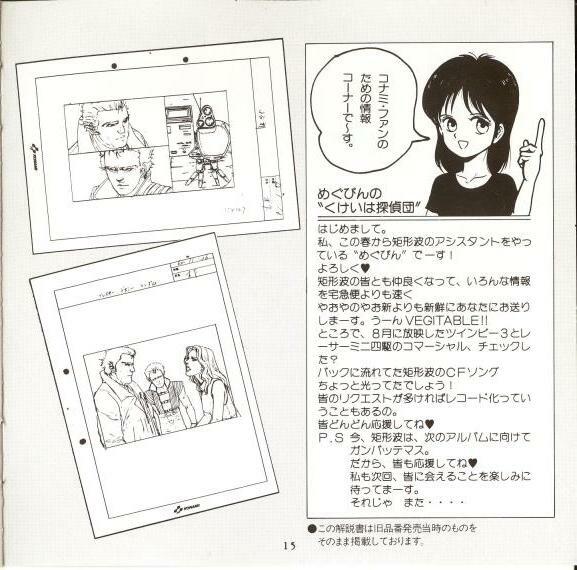 Mad: For my part, the storyboard in the plan were so superb, so I had fun drawing. Snake: For me, the early part of the development when there were only two, me and Mad, was the most fun. The feeling was like making a film or an anime rather than making a game, so as the adverse effect it was a painful (I came up with too much ideas), I worried whether it'll be really completed. IKA: Well, this really was a huge scale plan. How many character sheets were going to be in the initial estimate? Mad: Initially, I drew and drew but never ended. How many were there approx? Black: There were so many, so I couldn't foresee how fast I should draw to grasp the feeling of total work rate. Ultraman: So, from the programmer's view, it was nothing other than risk taking. When I was doing, I was praying all the way that the capacity would suffice. IKA: It looks that each of the characters has its fans... we received the letters. I personally like Catherine(7). Snake: Er, I'm a huge fan of Jaime, after all. I like Metal Gear beside. Mad: I forgot to configure the Metal Gear's occiput. Snake: Yes!! Metal Gear's unknown occiput! Mad: Actually, I am not good at that sort of thing. IKA: Beside the questionnaire postcards, some people sent chocolates for the Valentine Day (4) this year, what happened to those chocolates? Mad: Oh well, I'm sure all of us ate them! Snake: "Randum", why did you die!! Metal: We also received assorted sweets. All: We express our thanks. IKA: Now finally, please say something to the audience. Snake: Er, among the works I've done, I had highest satisfaction with Snatcher, but I'd like to keep developing even better. Mad: Snatcher is the biggest adventure of this century!! Ultraman: Spending this much of effort to make a large scale product has almost pushed me to the limit. I had learned a lot of things though, but at the same time I was scared that if I'd experience this twice I might die. Black: I hope to make something good again by referring to Snatcher, that we made this time, as my guide. Metal: Let me think. As a creator, I don't want to be satisfied with this one, I'd rather want to make a better game, and use this experience in other style of development. And, if we can get a lot of opinions from the user masses, the next one will be much easier to create... I'm waiting your postcards. IKA: Everyone, thank you for today. has escaped into the environment. the world has been wiped out. Then. . . . . 50 years Iater. . . The crazy atmosphere of Neo-Kobe-City. The human inhabitants are facing a terrifying situation. from,What it is and what it wants, no-one knows ! A new enemy weapon, an invader from space. . . . . ?? slain human and mingles into society. Like a normal human. them apart from real humanbeings. their own satety. . . . . . they are no.t embtional men. Speech bubble: This is the information corner for the Konami fans. I am "Megupin" who has been the Kukeiha's assistance since this spring. By the way, have you checked the TV commercials for Twinbee 3 and the racer mini 4WD (12) that we aired in April? The Kukeiha's commercial song played in their back, wasn't it a little brilliant! If you send us a lot of request we might release them in a record. P.S Presently, Kukeiha is doing their best toward their next album. I'm looking for the next occasion to meet you. (1) IKA is probably short for Ikariko, the Konami musician. 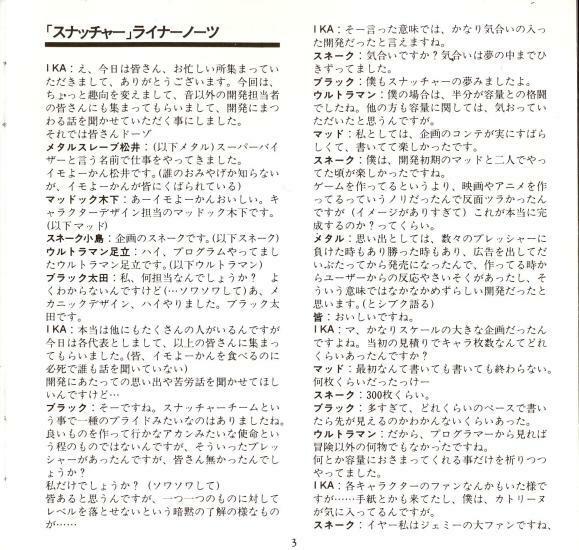 (2) IKA's "This occasion," line suggests that this style of Liner Note is included in every Konami game music CD released at that time, and that this Liner Note was one of them. (4) Japanese women customary sends chocolates not only to would-be boyfriends, but also to male celebs in Valentine's Day that is February 14. (5) I have no idea why Mad suddenly explains himself "I'm Haruka's mother", though I know the middle aged women prefer sending assorted sweets. "Haruka" might be one of the developer's acquaintance. (6) The script part writes down the English conversation in the CD, along with its Japanese translation. However, the tune titles are only written in Japanese, so I write them here. (7) Spellings of the personal names in this Script differ from any other Snatcher versions. (9) Kukeiha (literally "rectangular wave") was the famous Konami in-house music band. (10) Yaoshin is a common name for a greengrocer. I don't think any particular greengrocer is referred in this context. (11) VEGITABLE is probably a misspelled VEGETABLE. Megupin is trying to say freshness of her information is as vital to her as freshness of the vegetable is to a greengrocer. (12) A "racer mini 4WD" is a battery driven plastic car, a typical Japanese toy, of which Konami often holds its racing competitions.